I’m not completely useless in the kitchen, but after repeatedly being hit by my father whenever I accidentally allowed one pan to clank against another, I stopped cooking for people. The kitchen turned into a place of ridicule and blah blah blah – why get into it? – at this point I’d like to move on to a happier place, and that includes cooking for my son, extended family and friends with little to no stress involved. I want to cook well enough where photographing a dish won’t bring me to faux tears. 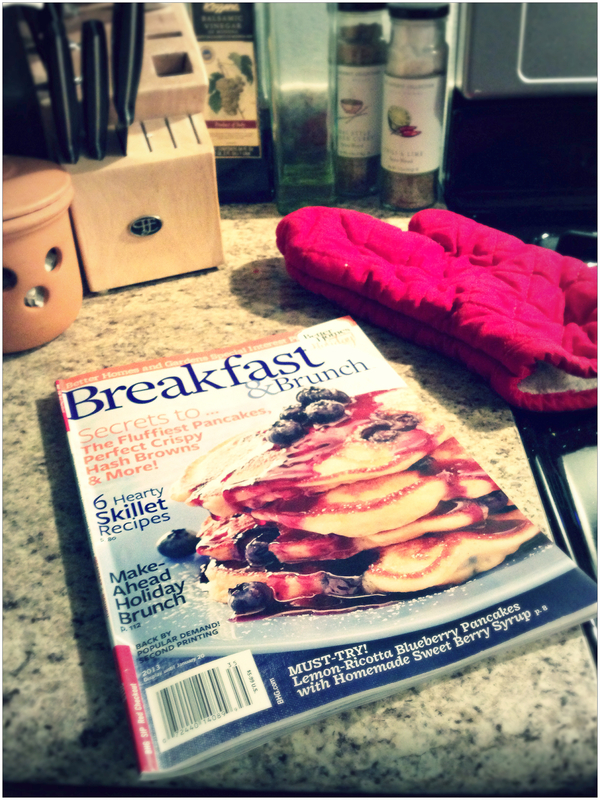 I already have an assortment of cookbooks, but today I purchased Better Homes & Gardens Special Interests magazine, Breakfast & Brunch. * I love this magazine! It’s got great recipes that I actually am interested in making. Besides the cookbooks, I’d like to take a cooking class at Sur la table or Williams Sonoma. Something simple to start. I’ve got a few friends that are willing to go with me, so I don’t even have to start alone, although going alone will probably bolster my feeling independence and strength. So maybe I’ll cook a few things and post there. Honestly – 1 Year of Single shouldn’t just be about dating. I find that too boring!